The GS-14/lieutenant colonel and GS-15/colonel Army Acquisition Corps Centralized Selection List (CSL) Acquisition Command and Acquisition Key Billet board announcements will be released July 17, 2017. The application closing date is Aug. 30, 2017. The Competitive Development Group/Army Acquisition Fellowship Program announcement opens July 25, 2017, and closes Dec. 14, 2017. Find out more about this GS-12/13 (or equivalent) three-year civilian leadership development opportunity. Course Number Changes: PMT 355, Program Management Office Course, Part A replaced PMT 352A; and PMT 360, Program Management Office Course, Part B replaced PMT 352B. PMT 352A and B remain acceptable predecessors to PMT 355 and PMT 360 until Oct. 1, 2019. New Course: ACQ 415, Strategic Interface with Industry; Level III certification in any acquisition career field (ACF) is a prerequisite. View the full interactive catalog description of the courses. Please note the changes to expired predecessor courses that may affect an Army Acquisition Workforce (AAW) professional’s ability to meet planned FY17 certification requirements. Check out the new July-September edition of Army AL&T magazine. 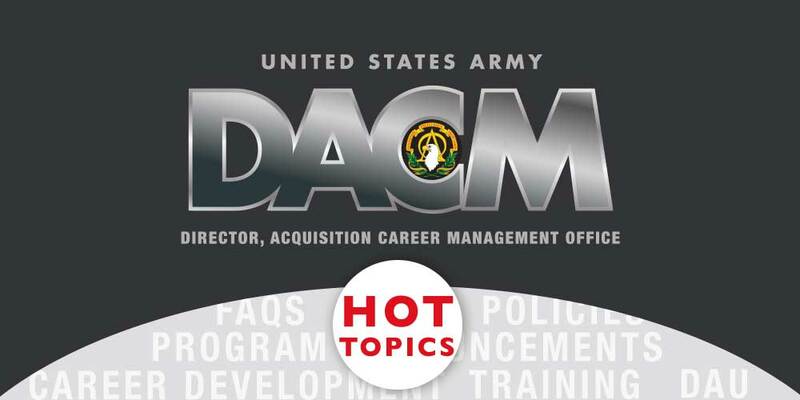 Read the newest edition of the Army DACM Newsletter. The Civilian Program Management ACF Model has changed! Take a look at all of the civilian ACF models. The AAW “Back-to-Basics” Summit. Last summer, as the Army DACM Office began building the Human Capital Strategic Plan for the AAW, representatives from across the Army Acquisition Community indicated the need for a face-to-face engagement with the workforce to reinforce the importance of career development, what it means to be part of the AAW and what resources are available. The pilot program will take place at Aberdeen Proving Ground (APG) North on Sept. 6, 2017, and at APG-South on Sept. 7, 2017. Annual AAW Ethics Training. There are six months remaining to get the 2017 calendar year ethics requirement knocked out. This annual requirement is mandated for all members of the Defense Acquisition Workforce. Completion is tracked via the CAPPMIS IDP. Maj. Gen. Harold J. “Harry” Greene Awards for Acquisition Writing Competition. ASA(ALT)’s fourth annual acquisition writing competition is open to everyone through Sept. 26, 2017. Winning entries are published in a special supplement in the January-March edition of Army AL&T magazine. Complete details and the call for submissions are located on the ASA(ALT) website.